Bayou Roofing has worked with many commercial and residential customers in the Acadiana area. Those listed below have agreed to share their stories about their Bayou Roofing experience. Please visit our Testimonials page to learn more. It is Bayou Roofing's ultimate goal to deliver exceptional products and services to each and every customer. We want all customers to feel as satisfied as those who so graciously wrote these testimonials. Joey is humbled by their praise and honored by their trust. 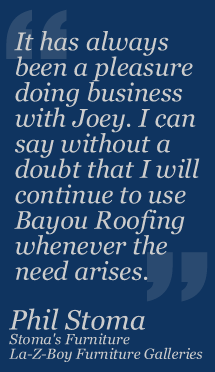 Bayou Roofing is continually expanding its list of happy customers. Won't you join them? Copyright © 2011-15, Bayou Roofing Co.